The Gulf Coast region of the United States is an ideal setting for the study of resilience. The region’s history tells a story of people and communities able to withstand adversity, rebuild after devastation, and navigate uncertainty. Woven into this narrative is a series of focusing events that contributed to the development of emergency management in our nation, including the Hurricane of 1900 in Galveston, Hurricane Andrew in Florida, and Hurricane Katrina, which affected the entire Gulf Coast region. Most recently the region has managed the biggest environmental disaster in history—the BP Deepwater Horizon oil spill. These events have not only defined and re-framed the role and purpose of our federal government in disaster management; they have shown that if resilience is to be found in tangible, meaningful forms, it is in the Gulf Coast. What is the state of disaster resilience across the Gulf Coast? 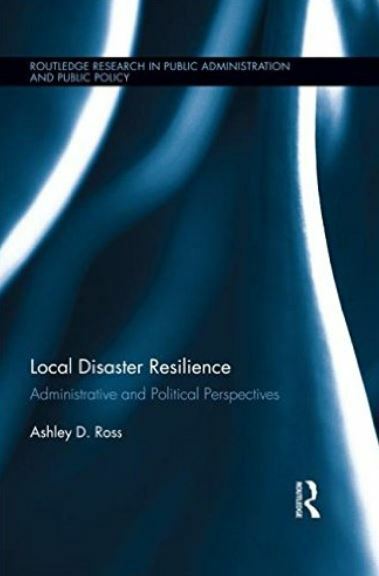 Local Disaster Resilience: Administrative and Political Perspectives systematically explores this question across the 75 counties adjacent to the Gulf of Mexico. Disaster resilience is defined as a set of adaptive capacities that imbue a community with the strengths needed to respond, cope, and recover from a disaster event as well as a process of collective action enabled by these capacities to adapt to the post-disaster environment. This theoretical frame sets up resilience as a set of capacities and a process, which are examined in three ways, as: 1) an adaptive capacities index, 2) perceptions held by EMs, and 3) collective action in response to and recovery from disasters. Drawing on secondary data sources as well as original surveys of county emergency managers and elected municipal officials, the analyses detailed in the book indicate that capacities for resilience, measured using Cutter’s Baseline Resilience Indicators for Resilience, are low in Texas and Mississippi while Louisiana and Alabama rank moderate to very high and counties in Florida vary considerably. Regression analysis of the capacity index point to the association of low resilience with small, rural counties and those that have experienced very intense disasters. Also evident are varied understandings of the meaning of disaster resilience among EMs. Those in urban contexts are more likely to perceive resilience as bouncing back while EMs in rural contexts are more likely to reference self-sufficiency; those that have experienced severe hurricane events are more likely to describe community resilience as preparation while those in counties that have been severely impacted by the Deepwater Horizon oil spill are most likely to cite recovery. Examining county EMs’ and municipal elected officials’ experiences in past disasters, the analyses indicate that positive ratings of coordination with citizens, non-profits, private partners, and neighboring counties were associated with greater disaster severity and emergency management resources. In all, the results point to past disaster experience, local government resources, and urban-rural context as critical factors related to levels of disaster resilience. For more details on this book as well as the tables, figures, and data presented in the book, click here: Book.